Novobrace™ | Tendonitis, Desmitis and soft tissue injury treatment for horses – What Exactly Is Novobrace? 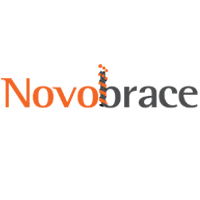 I bet you are wondering what exactly Novobrace is…. Novobrace is a new treatment for soft tissue injuries such as bowed tendons and suspensory ligament desmitis. Novobrace is different than any other treatment because it is a “cross-linking agent.” This means that when Novobrace is injected into the tendon or ligament it forms cross-links, which are bonds between cells that help hold together the structure. Cross-links are naturally formed between the fibers of the tendon or ligaments, but they can take a long time to form after a tendon or ligament is injured. Novobrace speeds up the natural healing process. Also, these cross-links give the injured area some extra support, so that the horse is able to get out of a stall and begin rehab much faster than usual, because we are less worried about the injury getting bigger. Essentially, Novobrace forms an “internal brace” for the injury. Novobrace works great on new or old “bowed” tendons (superficial and digital flexor tendon injury) and suspensory injuries. THE SCIENCE: Here is a video that does a great job of explaining tendon anatomy, and how Novobrace works. THE PROCEDURE: Your veterinarian can treat your horse with Novobrace with a simple ultrasound guided injection procedure. Your horse will not need to undergo general anesthesia, just a simple injection of some sedation. The entire procedure is quick and virtually painless (just a couple pricks with some tiny needles). AFTER CARE: After one week of strict stall rest and bandaging, your equine athlete will be ready to begin an intense rehabilitation schedule. Unlike the usual rehab schedules, with Novobrace you can begin to turn your horse out in a very small paddock the very first month after treatment!! You can begin riding at 3 months, and by month 7 your horse will be physically and mentally prepared to begin full training/work. Your veterinarian should repeat an ultrasound examination every 4-6 weeks to ensure that your horse is healing well. We promise that you will be impressed by the results!!! See us next week at AAEP Booth #1001, Centaur Animal Health and Novobrace will be there to answer all your questions!